The Lab is an experimental voyage through time and space that doubles up as an enticing 5 reel new slots game. Embark on your mission to a universe where cash prizes and free spins are just a chemical reaction away when you match chromosomes and test tubes to unlock exclusive sliding reels. Swedish based gaming company Elk Studios were set up in 2012 have a passion for games and have taken mobile casino games to the next level. You can learn more about Elk Studios here. Thousands of players enjoy Elk Studio games and the servers generate hundreds of transactions per second. The company strives to ensure all games are delivered with a human touch. Elk Studios have evolved during its time to create a variety of stimulating and enjoyable games to its players. 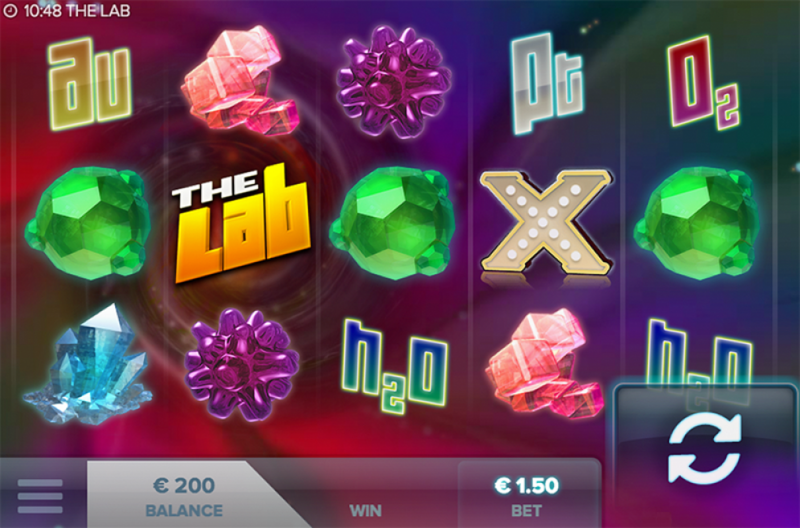 The Lab is a 5-reel 15 payline game playable from 15p to £90 per spin. This science themed game puts you in the heart of a real life lab with science-y based features with a multi-coloured swirling vortex in the background. You can create explosive wins through the crystal molecules and the chemical element of the periodic table. Unlike traditional slot games it doesn’t using playing card values but instead follows the game’s theme and used chemical symbols on the reel. 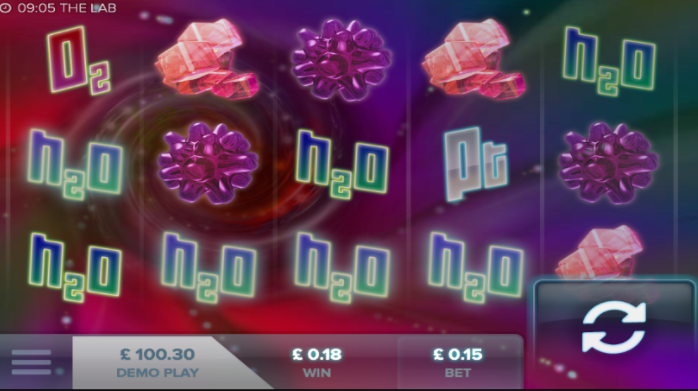 The game features 8 main symbols these include a range of coloured molecules – pink, green, purple and blue and elements of the periodic table; H20 (water), 02 (oxygen), Pt (Platinum) and Au (gold). Each time you create a win the winning symbols will display a row of shooting stars across your screen. The game also features jazzy background music with some swooshing sound effects. Jumper – raises best by 1 levels after every win for 4 levels until the lose. Booster – automatically raises your bet level by on after each loss and will stop increasing after 4 levels and will remain in that position until you win. The X-Scatter symbol is one to look out for. For each one that appears on the reel the winning payline will be increased by 2x multiplier, the more scatters you get the bigger the win you get. The main aim of the game is to get the Lab Logo to land over the vortex. The key to triggering the bonus feature in this game in the lab logo. Landing directly over the vortex on reel 2, row 2, it will slide across the reels and trigger the free spin feature. At this point you will be granted an extra 10 free spins which can be added during the feature. 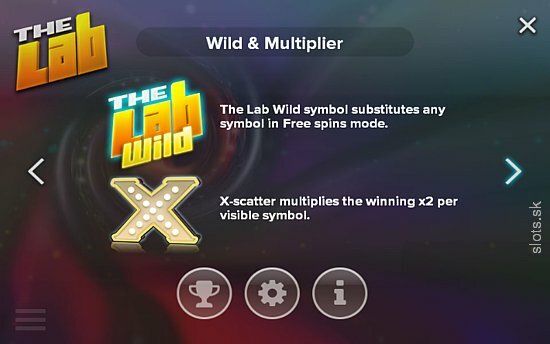 The lab logo symbol is a wild as well during free spins and everything but a X-Scatter will be substituted. Multipliers will also play out during free spins and all winning paylines will automatically be subjected to a 2x multiplier and doubled. The Lab can take a little time to get used to but when you do it is worth the waiting and an enjoyable game that offers a unique theme. The game is well worth a try as the aesthetics and soundtrack are pleasing and has interesting features. RTP 96.3%. Here's another excellent easy slots game.